on July 25, 2017, 11 a.m. The appetite for fast food just keeps on growing. In cities across the Asia Pacific, the likes of fast food chains continue to court diners with their affordable prices and efficient service. But such convenience comes at a price and record levels of obesity have sparked global concern about the impact that fast food has on our everyday lives. YouGov, the world’s leading online research firm, polled over 9,000 residents across APAC* to explore how people view fast food and obesity in more detail. While there is overwhelming support for greater action to curb the obesity epidemic, fast food continues to be a firm favourite with consumers across the region. Despite health warnings, its popularity seems assured; just 7% of respondents dislike fast food. Of all the delicious feasts on offer, the most popular type of fast food in APAC is fried chicken, favoured by 34% of those polled. Pizza and burgers also score highly, chosen by 28% and 20% of people respectively. Preference of fast food is the same across APAC except for Australia, Hong Kong and the Philippines, where people like pizza more than fried chicken. Such a wealth of fast food options and the proliferation of their popularity have led some to question the fast food industry’s role in the obesity crisis. This rings true of public opinion, as four-fifths of those polled (81%) believe that fast food contributes to obesity. 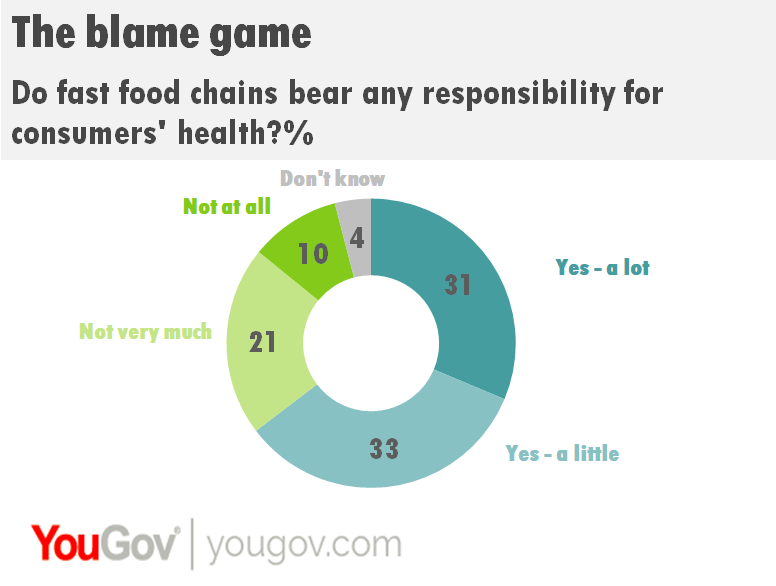 Moreover, 64% believe fast food chains bear some responsibility for consumers’ health, suggesting that there may be scope for fast food chains to play a greater role in public health. Asked about a range of possible measures to tackle obesity, the ideas that attract the broadest support are: to increase the number of low fat options available to consumers; to limit the amount of fat in foods that fast food chains are allowed to sell; and to make more information available about what is in fast food. Each of these proposals is supported by half of those polled in APAC (50%). Other popular measures include forcing fast food companies to make mandatory contributions to the healthcare system (supported by 39% of those polled); an increase in public/private partnerships to support healthy eating (supported by 38%); and encouraging fast food companies to make voluntary contributions to the healthcare system (30%). 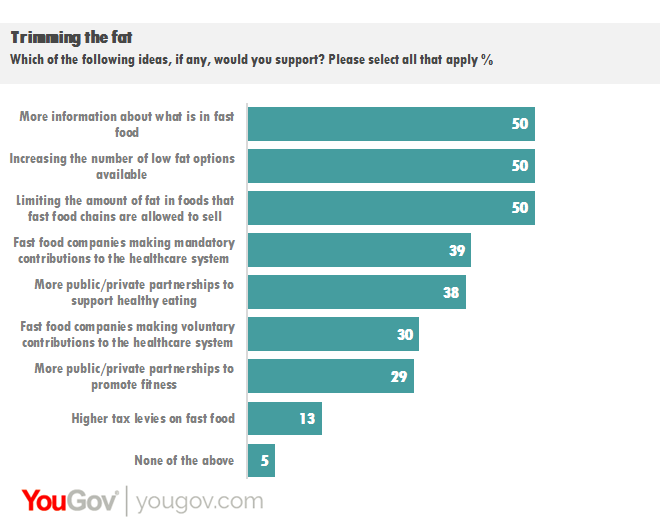 Overall, just 5% of those polled would not like to see any of the above options introduced, indicating that there is widespread support for action on obesity.